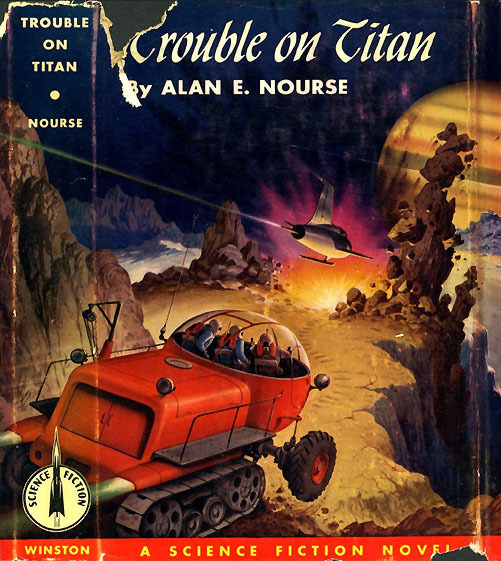 The Golden Age has posted a small collection of science fiction book covers and endpapers by Alex Schomburg (Alejandro Schomburg y Rosa), best remembered for these and for his extensive work for Timely Comics in the 1940’s. Timely would later become Marvel Comics. Born in Puerto Rico, he came to New York in the 1920’s and began his career in illustration in the decade that followed. Schomburg was a Hugo Award nominee in 1962 and went on to collect many other awards during the 1980’s before finally receiving a Lifetime Achievement Award from the 47th World Science Fiction Convention in 1989. Of the pictures in this Golden Age collection I think I’m most fond of the endapaper design above. 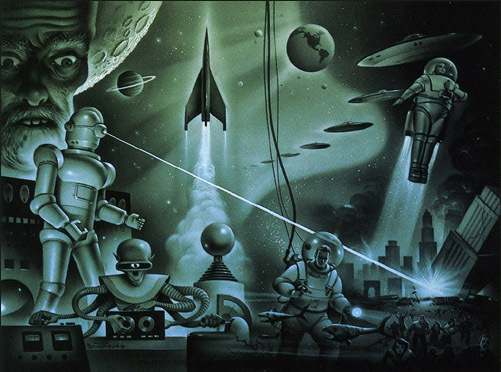 But you can see many other pieces (with an emphasis on his work for comics) at the Alex Schomburg Estate web site.